Lost In The Warp: Heroes of Armageddon Charity! My buddy and teammate Dave Taylor is neck deep in an AMAZING charity Miniature build (Again) and I hope that you read this and support this endeavor! Several other friends including the incredible Mathieu Fontaine are also contributing models. Check it out! In the last 4 months our world has seen some extraordinary disasters, both natural and manmade. The people in the Middle East and Africa have been battling their governments and each other for a different and hopefully better future. Many people are dying and being injured today in Lybia, the Ivory Coast, Syria and in many other places as well. We cannot change any of these things by ourselves. But we can help support organizations that go to Africa and Japan and the whole world to help people in need, people that risk their own lives to better the life of a stranger. One of these groups is Doctor without Borders. An amazing organization you can check out their news feed here. DWB go to places that most organizations have left behind and try against odds to fulfill their oath: to help people in need. And they need money. And thats where we come in...last year with your help the Storm Wardens Project raised over 16,000 dollars for this amazing charity. Here's the link, the page is still up. This was all YOUR success. We just opened up a PayPal account and built 2500 points of models, you all showed that our community can come together and do something amazing. John and I thought it better to raise the stakes and create a much larger project: we're giving away FOUR 3000 point armies. We hope that you will all pitch in and let your heart speak. This is the change we all can make, instead of ignoring the news. Every dollar of your support gives you a chance to be one of the lucky four new army winners at the end of this drive.10 dollar contribution =10 chances to win. 100 dollars = 100 chances...you get the idea. At the end of the drive, in July, we will choose the winners. Then, the armies will travel to Games Day in Chicago, where they will be displayed. After that the winners can take their army home or we send it off. In short: the more you contribute, the better your chances. More importantly, the more you contribute, the more you help to make the world a better place. Our Games Day Diorama will depict the 3rd battle of Armageddon with 4 armies: Steel Legion, Blood Angels, Ork Hordes and Speed Freaks. 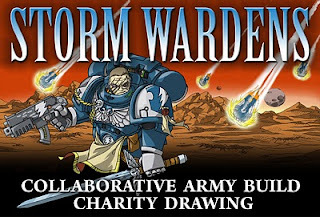 We have expanded the all star build team from last year with a handful of Golden Demon winners and we also hope to go bigger and better by reaching out to more of you and the industry and collecting even more than we did last year for Doctors Without Borders. These four Team Leaders have commited to finishing up these armies to the highest standards. We have also been able to lock down some Golden Demon winners to paint the centerpieces of the armies and have created a larger build team, all of which are great artists who have donated their time and effort to this cause. Just like last year, as our way of saying thanks for your help, we will also have some weekly prize drawings along the way so yet another way win something great for your trouble. Everyone who has supported the project up to that point will be eligible to win. Expect great prizes. You can help spread the word and link to the Project site. You can create a special blogroll with all the builders blog project updates. You can hold a local event to raise money or just post some flyers at your favorite gaming spots. You can send in prize or model donations and be part of the many sponsors that help us out. You can talk to family and friends and have them make a contribution on your behalf. You can even send us models that we then distribute to the teams that need them. A list will go up soon with requests. Are you ready for 4 awesome armies? Are you ready for Armageddon? Cy'all next week with my Rhulic Reveal! - James "TKKultist"